I even dreamed about it last night. have you seen this… or this yet? or this is fun too, look, there’s bacon on your site. The best bacon I have had in recent memory was at The Columbian Cafe in Astoria. The gentleman behind the grill lovingly made the bacon he served us from Carlton farms side pork that he cured himself. He then let me ogle his copy of Charcuterie (by Ruhlman, Polcyn, and Keller), which I have since purchased and recommend to anyone who is interested in the art of curing meat. This chef’s passion for food truly inspired me to pursue my interest in what is becoming a dying craft in this country.This was a couple years ago, and since that time, I have made my own corned beef, sausage, jerky, smoked fish, etc. Have fun during the judging! 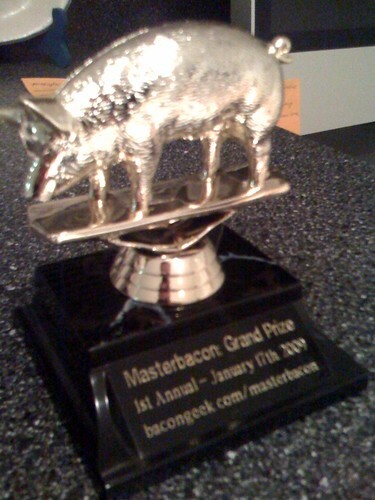 May the best bacon win! Oh my Bob Cami that is so funny. Hope you have a fabulous time, hee hee. d) received and displayed that trophy. oooh… how do i get to be a judge at the next one!!?! ?